The Casey Brown Company has acquired the San Diego Union-Tribune property, located at 350 Camino de la Reina just north of I-8 and west of Hwy 163 in Mission Valley, for $52 mil. Doug Manchester, the former publisher of the Union-Tribune was the seller. The property, situated on 13 acres of infill land in the center of San Diego County, conists of a 170k sf , five-story office building and a 190k sf, three-story industrial building, which was the former newspaper print facility. 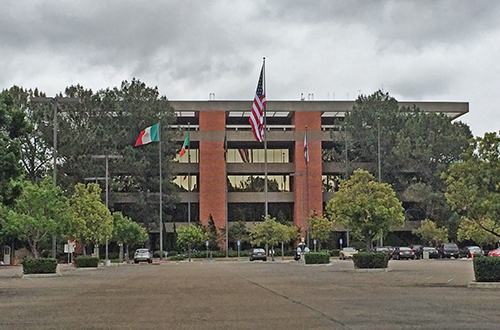 The Casey Brown Company plans to upgrade the existing office building into an amenity-rich, Class A corporate campus. The industrial building is currently being evaluated for alternative uses. The site was also recently entitled for 200 apartment units with a unanimous approval by the City Council. The buyer was attracted to the property in part because of its desirable central location at the intersection of I-8 and SR-163, which is further enhanced by the walkability to the Green Line Trolley stop and Fashion Valley, one of San Diego’s premier malls. CBRE will be leasing the property for the new owner. The campus acquisition marks the first purchase under the newly launched Casey Brown Company. Company president and CEO Casey Brown has a long history of acquiring commercial real estate in the area. As past president of BBL Commercial Real Estate, Casey was instrumental in the acquisition of many quintessential properties in San Diego such as 2550 Fifth Avenue, a 13-story financial building where Mr. A’s restaurant is located, the downtown Bank of America and Commonwealth Towers, and The Palladium building.